heated up the World Superbike Pits at Laguna Seca Raceway for our 2017 Calendar Shoot. 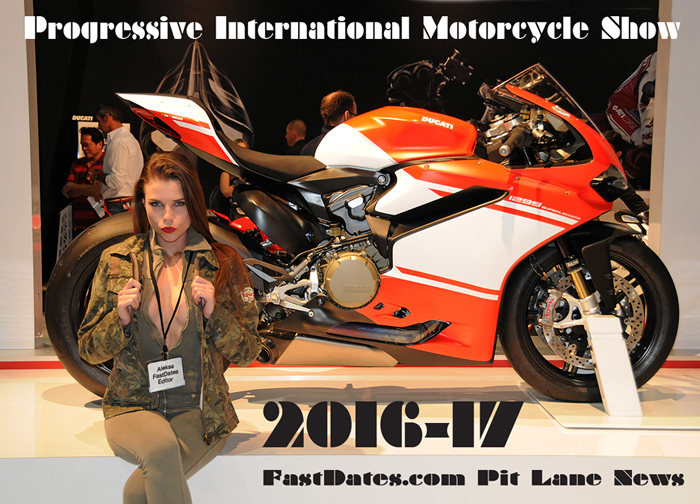 Feb 15th 2017 - FastDates.com Calendar publisher and photographer Jim Gianatsis is excited to announce that one of our favorite Calendar Kittens, spokes model and Rockstar Energy Drink girl Jessica Harbour from Huntington Beach, CA, has been selected to return with FastDates.com to Mazda Raceway Laguna Seca, Monterey, CA, for the 2017 SBK World & MotoAmerica National Superbike Race Weekend July 7-9th to shoot the next edition of the Fast Dates World Superbike Swimsuit Calendar and serving as an official SBK World Superbike Podium and Umbrella Girl. Jessica previously shot for Jim with all the top factory race bikes at the 2013 Laguna Seca WSBK round and served as an official SBK girl that weekend as well, with her pictures appearing in the 2015 Fast Dates Calendar. Jessica has continued to work at Laguna Seca WSBK the last years as well, both as an SBK and factory race team umbrella girl. 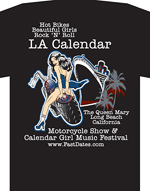 Joining Jessica the July 7-9th Laguna Seca race weekend for both the Calendar Shoot and SBK Umbrella Girl duties will be a new FastDates.com Calendar Kitten rookie, fellow Rockstar Girl Courtney Riggs from Sacramento California. Both Courtney and Jessica are represented by the modeling agency Umbrella Girls USA, and work together as Rockstar Girls at the 2017 AMA Supercross Championship rounds across America. 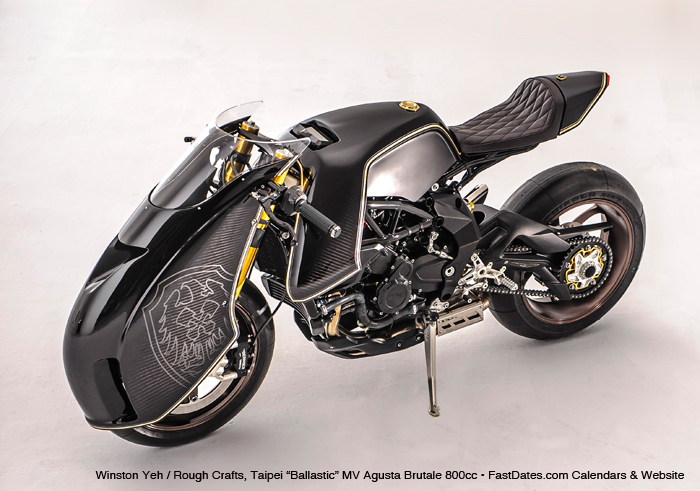 Got an exciting Calendar Worthy Custom Bike? Email Us a picture with details and you could earn a Complimentary Invitation to the Calendar Party. • Sunday October 15th 2017 Rider Roundup at Paramont Ranch in Agoura, CA. 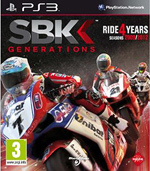 SBK Trivia - Melandri's Win in Race Two marked 100 wins in World Superbike for Italian Riders. 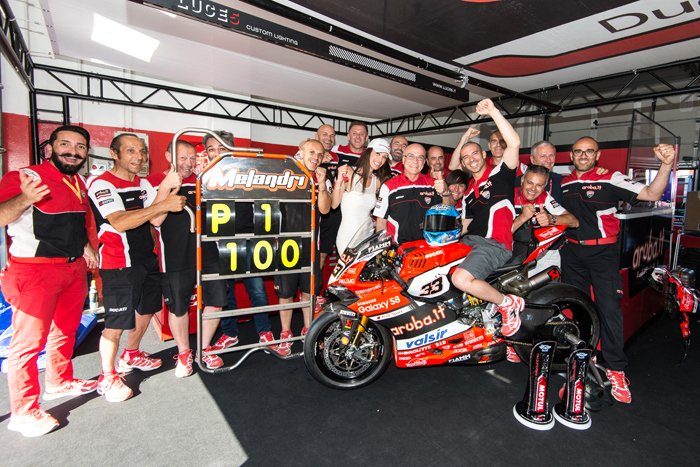 The Aruba.it Racing - Ducati team wins Race 2 at Misano with Marco Melandri. Chaz Davies watched the race from the pits after being discharged from the hospital"This is the first weekend where we’ve felt like the benchmark"
Misano Adriatico, Rimini Italy June 16-18th, 2107 - After a difficult Saturday Race One at Misano in Italy, which saw Race leader Chaz Davies fall in the next to last corner on the final lap and take out his persuer Jonathan Rea, handing the win to Rea’s Kawasaki team mate Tom Sykes, the Aruba.it Racing - Ducati team bounced back in Race 2 at Misano Adriatico (Italy) with a masterful win by Marco Melandri. 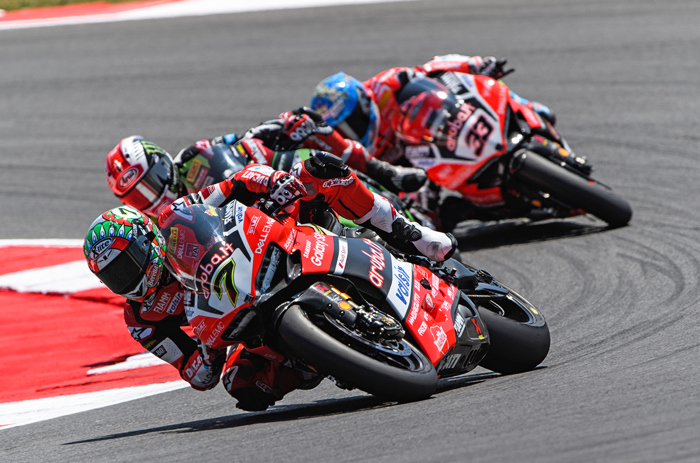 The Italian rider, whoalso crashed out yesterday during the last lap while fighting for the win, mounted a spectacular comeback from 10th position on the grid to take his maiden victory with the Panigale R and his 20th overall in WorldSBK. Declared unfit for Race 2 due to a fracture of the transverse process of L3 (3rd lumbar vertebra) and a contusion of the left thumb caused by a crash in Race 1, Chaz Davies watched the race from the pits after being discharged from the hospital. The Welshman will now observe a period of rest with the intention to be back on track for the eighth round of the season, scheduled for July 7-9 at Laguna Seca (U.S.). After seven rounds, Davies and Melandri are respectively third (185 points) and fourth (163 points) in the championship. Chaz Davies (7), Jonthan Rea (1) and Marco Melandri (33) were this close all reace in thier battle for the win in Saturday's Race One, with all three riders going down on the last lap to hand the race win to Kawasaki's Tom Sykes who is about 4 seconds behind them. RACE ONE Saturday June 17th 2017 - A breathtaking Race 1 at the Misano World Circuit “Marco Simoncelli” on Saturday afternoon saw Tom Sykes (Kawasaki Racing Team) take advantage of three big crashes ahead of him to secure maximum points, with Alex Lowes (Pata Yamaha Official WorldSBK Team) and Jonathan Rea (Kawasaki Racing Team) also on the podium. In the final stages of the last lap Chaz Davies (Aruba.it Racing - Ducati) crashed out of the lead and was hit by Rea, with Rea able to pick up his bike to finish third, behind winner Sykes and second placed Lowes. Moments before that incident Marco Melandri (Aruba.it Racing - Ducati) also crashed out when fighting for a podium finish and he would ultimately finish 15th. Michael van der Mark (Pata Yamaha Official WorldSBK Team) also spectacularly crashed out at turn 13 with 7 laps to go, with Rea close by, after the Dutchman had led for most of the race. Van der Mark took over at the front from provisional leader Rea in the early stages and had built up a big lead at one stage before his advantage decreased and then he went down. Behind Sykes, Lowes and Rea the top five also featured Jordi Torres (Althea BMW Racing Team) and Xavi Fores (BARNI Racing Team). Meanwhile in the first race of the Pirelli Riviera Di Rimini Round, Eugene Laverty (Milwaukee Aprilia), Randy Krummenacher (Kawasaki Puccetti Racing), Roman Ramos (Team Kawasaki Go Eleven), Lorenzo Savadori (Milwaukee Aprilia) and Raffaele de Rosa (Althea BMW Racing Team) were all in the top ten. 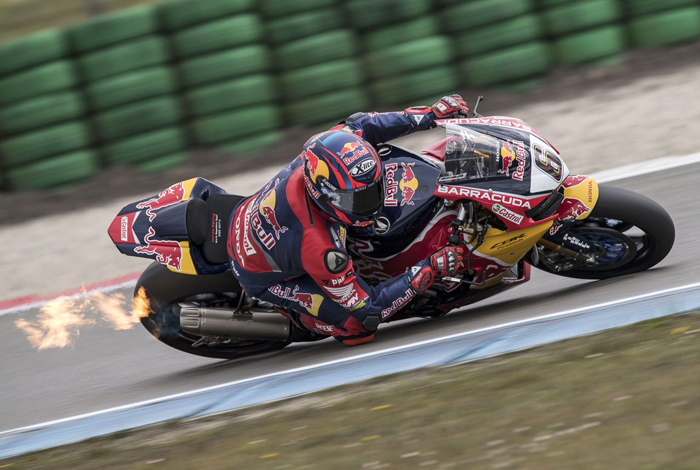 There were retirements for Stefan Bradl (Red Bull Honda World Superbike Team), Leandro Mercado (IODARacing) and Riccardo Russo (Guandalini Racing). Leon Camier (MV Agusta Reparto Corse) crashed late on but remounted to finish 11th. 1st - Tom Sykes (Kawasaki Racing Team) - "It was a different win but it was 25 points all the same. For this way we have to be happy, I arrived on my limit, we knew the tyre never had the push but this is racing. The guys at the front were incredibly fast but we arrived at our limit, understood it and rode around it." 2nd - Alex Lowes (Pata Yamaha Official WorldSBK Team) - "It was really lucky to get the podium, but the main things are that the guys are alright as the conditions were really tricky out there. I was really happy with my pace and I was doing as good laps as I have done all weekend on lap 20, so you have to be there at the end I'm enjoying the moment." 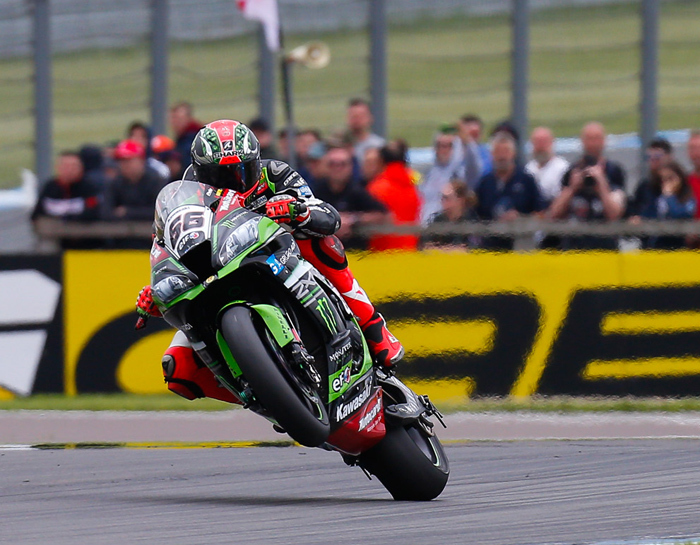 3rd - Jonathan Rea (Kawasaki Racing Team) - "It was a crazy race, I was settling my pace as Van der Mark crashed. I ran off track which allowed everyone to catch me again and I did everything I could to plan a last lap attack, into the last corner. But once Davies crashed, unfortunately I hit him I'm so sorry for this but I had nowhere to go. 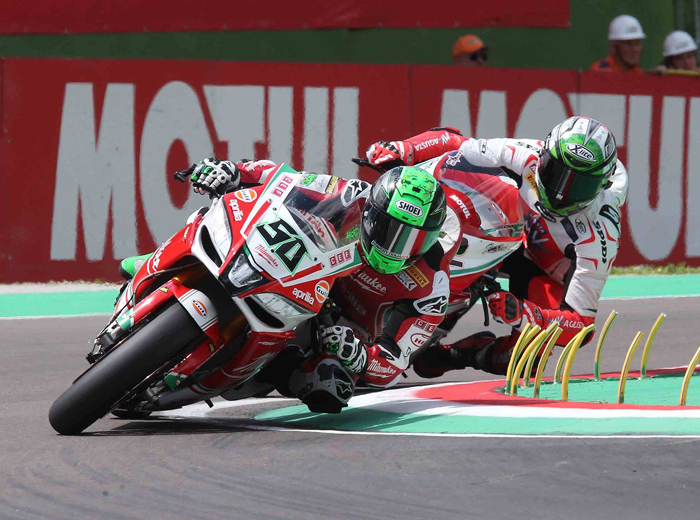 Right now I am thinking about him and I hope he's ok."
Jonthan Rea(1) and Marco Melandi(33) came back from their crashes on Saturday to battle for the Race win again on Sunday with Melandri hold off the Kawasaki rider to give Ducati a home win. RACE TWO Sunday June 18th 2017 - At the Pirelli Riviera Di Rimini Round on Sunday it was home rider Marco Melandri (Aruba.it Racing - Ducati) who took a stunning first win of 2017, with Kawasaki Racing Team pair Jonathan Rea and Tom Sykes also on the podium. Responding positively to his last lap crash in Race 1, Melandri came from tenth on the grid to return to winning ways with a +1.113s victory over Rea. It was Melandri’s first WorldSBK win since 2014 and the 100th victory for an Italian rider in the top class of the championship. The second place result for World Champion Rea strengthened his title defence as he now leads the standings by 50 points after seven rounds. It was also a successful weekend for Sykes as he followed up on his Race 1 win with another podium result to continue his excellent recent form. Starting from pole Jordi Torres (Althea BMW Racing Team) had held the lead for 8 laps but he was hugely frustrated to drop out of the race with a technical problem with just 3 laps to go when riding in second place. Unfortunately, Jordi Torres, who was comfortably in line for a podium finish, suffered a tyre issue on lap 18 which prevented him from finishing what was easily, until that point, the best race of his season so far. Raffaele De Rosa did well to finish race 2 in seventh place today. 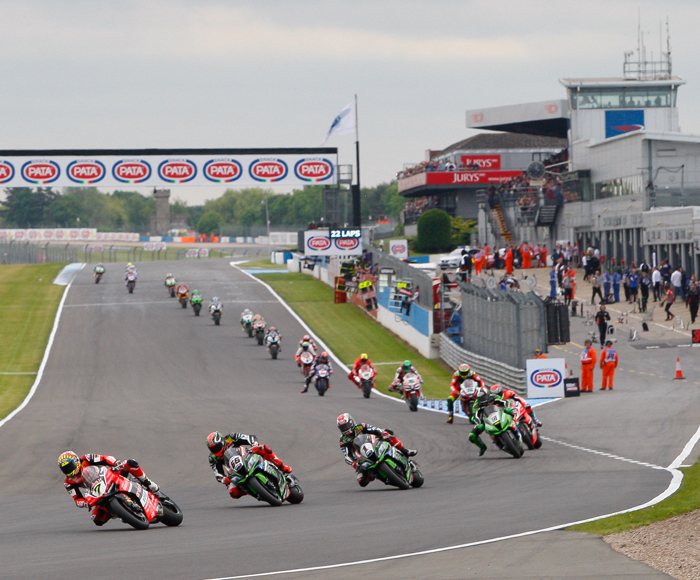 The top five was completed by Michael van der Mark (Pata Yamaha Official WorldSBK Team) and Eugene Laverty (Milwaukee Aprilia), with the Dutchman crossing the line fourth and the Irishman fifth. 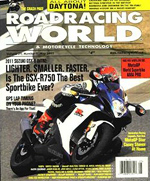 Lorenzo Savadori (Milwaukee Aprilia), Raffaele de Rosa (Althea BMW Racing Team), Randy Krummenacher (Kawasaki Puccetti Racing), Leandro Mercado (IODARacing) and Stefan Bradl (Red Bull Honda World Superbike Team) completed the top ten. Roman Ramos (40) was involved in the battle up front between Rea (1) and Melandri (33) before his Kawasaki broke. 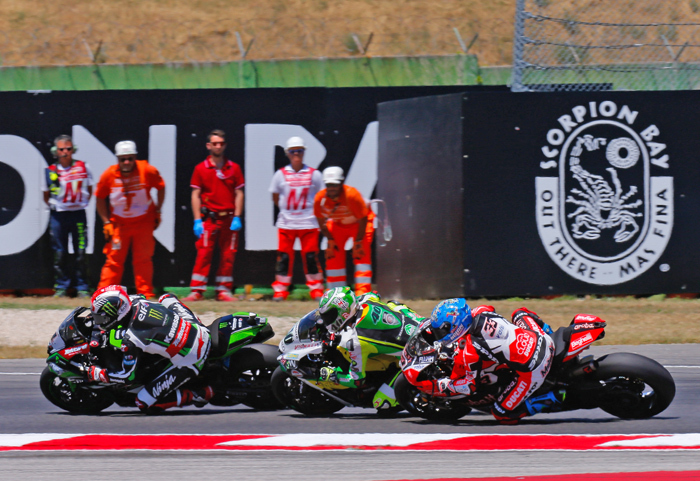 Only 12 riders finished the race at the Misano World Circuit “Marco Simoncelli”, with the likes of Leon Camier (MV Agusta Reparto Corse), Xavi Fores (BARNI Racing Team) and Roman Ramos (Team Kawasaki Go Eleven) all retiring with technical problems. With 10 laps to go Alex Lowes (Pata Yamaha Official WorldSBK Team) went down at Turn 2 and he was unable to finish the race. After his crash in Race 1 Chaz Davies (Aruba.it Racing – Ducati) was unfit to race on Sunday, having suffered a closed thoracic trauma, a fracture of the transverse process of L3 (3rd lumbar vertebrae) and a contusion of the left thumb. 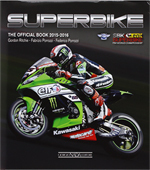 The WorldSBK riders will next be in action at the Geico US Round over the 7th to 9th July weekend. "It was not easy, I had so many good races at the beginning of the season and then we dropped off, but we made some good changes after the test so the bike works a lot better for me. To win here and in front of all of Ducati, all my family and friends is unbelievable for me to explain." "Honestly the race was very difficult and I didn't have too much more pace to give .We only made some minor changes to yesterday, but the bike felt completely different. I am happy with the result but disappointed in the bike and myself. At the mid point of the season its good to get a good set of points under our belts." "Today I was a lot closer but I am disappointed in the early laps, for some reason I use the bike and tyres to their full potential. We made some good passes early on, but when we got to Torres and Fores I wanted to go but I didn't have the rear traction. However the positive is that we had a good weekend in general." Sunday, 25 June 2017 -Valentino Rossi (Movistar Yamaha MotoGP) penned another stunning chapter in what is now the longest winning career in the history of Grand Prix motorcycle racing at the ‘Cathedral’ of speed, as the number 46 took his 115th win in the Motul TT Assen, more than 20 years after his first. Six hundredths of a second was the distance between victory and podium, as Rossi just headed compatriot Danilo Petrucci (Octo Pramac Racing) over the line. Reigning Champion Marc Marquez (Repsol Honda Team) won a three-way fight for third to complete the rostrum in another close contest, beating Cal Crutchlow (LCR Honda) by 0.042 at the flag. At lights out, it was Johann Zarco (Monster Yamaha Tech 3) who took the holeshot from his first ever pole position despite a better start from Marquez, and the Frenchman led the field away as Rossi took Petrucci for third. Behind was a mid-pack dogfight for fifth as Scott Redding (Octo Pramac Racing) led Andrea Iannone (Team Suzuki Ecstar), Andrea Dovizioso (Ducati Team), Alvaro Bautista (Pull&Bear Aspar Team), Maverick Viñales (Movistar Yamaha MotoGP), Cal Crutchlow and Jack Miller (EG 0,0 Marc VDS) in the early stages of a race that would go on to be a classic. As the front four settled into a game of high-octane chess and pulled a gap, Redding was pushing hard in fifth to escape from those on the chase – but ‘DesmoDovi’ and Viñales were soon on the scene, with the Spaniard taking over in fifth to hunt down the leaders as Rossi then struck against Marquez at the front. Pushing to close down a three second gap back up to the top four, the Movistar Yamaha MotoGP rider lost control at the final chicane and slid off just ahead of key rival Dovizioso – suffering his second DNF of the year. As the rider from Roses made it back down pitlane, Petrucci took second from Marquez and the ‘Doctor’ began to pull away in the lead – over a second ahead with nine to go. And then? It started to rain - and the story was evidently far from over. As the flag flew to signal bike changes were allowed, first in was Zarco, with the Frenchman taking the gamble just ahead of Hector Barbera (Reale Avintia Racing) as the conditions remained in the balance and the majority stayed out. It was initially a four-way battle for the win as ‘DesmoDovi’ exploded onto the scene at the front, with Rossi back in the clutches of his compatriots and Marquez – but the rain began to fall again. 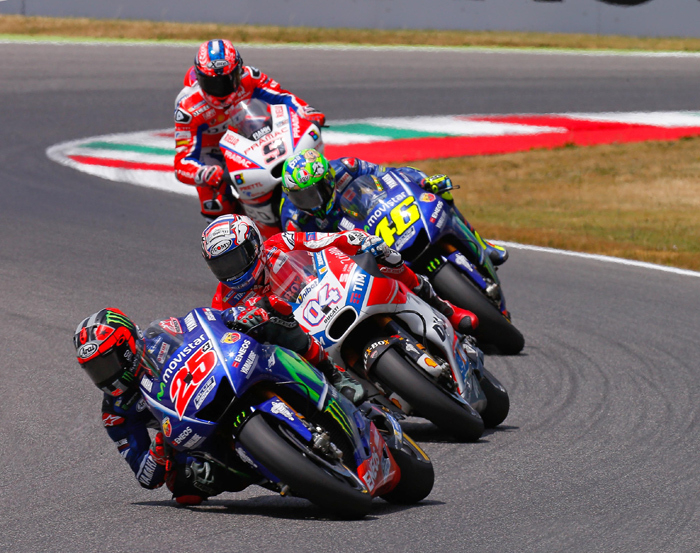 As the last lap dawned, it was Petrucci dueling Rossi at the front, as Marquez and Dovizioso suddenly found themselves hunted down by Crutchlow and the stage was set: a duel for the win, and a three-way fight for third. Past backmarkers, through the rain and incredibly tight together over the line, it was the ‘Doctor’ first at the flag – with Petrucci forced to settle for second as the number 46 took his first race win in over a year and the 115th of his career, extending his winning career at world level to the longest in history. Behind Petrucci, the battle raged and Marquez beat Crutchlow over the line by only 0.042 to complete the podium, with ‘DesmoDovi’ fifth at the flag – and now heading to Germany with the Championship lead. Jack Miller navigated a difficult race to take another impressive result at the TT Circuit Assen where he won last year, crossing the line in sixth after staying at the sharp end throughout. Karel Abraham (Pull&Bear Aspar Team) shone in the circumstances to move through in the latter stages, dueling Loris Baz (Reale Avintia Racing) over the line as the two took P7 and P8 respectively. Andrea Iannone (Team Suzuki Ecstar) took some solid points in ninth, just a tenth off the two Ducatis ahead of him. Aleix Espargaro (Aprilia Racing Team Gresini) completed the top ten for some good points after a difficult race last time out, ahead of a stunning result for his brother Pol Espargaro as the younger of the two took the best yet result for Red Bull KTM Factory racing in P11. The KTM rider beat Tito Rabat (EG 0,0 Marc VDS) by less than a second as the 2014 Moto2™ World Champion took another points finish in P12, ahead of a difficult day for Dani Pedrosa (Repsol Honda Team). Zarco’s tyre gamble didn’t pay off, with the Frenchman then also handed a ride through for speeding in the pitlane and eventually classified in P14, leading the group the riders who went in to change bikes – Jorge Lorenzo (Ducati Team) was next, completing the points, ahead of Hector Barbera (Reale Avintia Racing) and Alex Rins (Team Suzuki Ecstar). Bautista was a DNF, as well as Jonas Folger (Monster Yamaha Tech 3), Bradley Smith (Red Bull KTM Factory Racing), Sam Lowes (Aprilia Racing Team Gresini) and Scott Redding. After another chapter of history was written at Assen, ahead awaits the Sachsenring for the last race before the summer break. And with a new name at the top of the standings: Andrea Dovizioso. Catalunya, Spain, , Sunday June 11th 2017 - Andrea Dovizioso (Ducati Team) has taken an incredible second win of the season in the Gran Premi Monster Energy de Catalunya, making him the first Ducati rider to score back-to-back victories for the Borgo Panigale factory since two-time MotoGP™ World Champion Casey Stoner achieved the feat in 2010. Reigning Champion Marc Marquez (Repsol Honda Team) left a spate of crashes in practice behind in the race to take second, with his teammate - polesitter Dani Pedrosa - completing the rostrum. There was drama off the line as Pedrosa got a good start from pole and Jorge Lorenzo (Ducati Team) almost clashed with fellow front row starter Danilo Petrucci (Octo Pramac Racing) – with Petrucci then making contact with Marquez. The Italian dropped back and the reigning Champion pulled clear as Lorenzo attacked for the lead, taking over at the front. Championship leader Maverick Viñales (Movistar Yamaha MotoGP) found himself heading through the run off area at Turn 1 off the start and dropping back, with the Spaniard then facing a fight back from outside the points after a tough weekend – and teammate Valentino Rossi unable to make big progress from P13 on the grid either. Lorenzo led Marquez and Pedrosa, with Dovizioso on the hunt in fourth and Jonas Folger (Monster Yamaha Tech 3) a big gainer off the line to move up into fifth. Next it was Marquez who struck for the lead, with Pedrosa needing no invitation to follow him through. The ‘Spartan’ then lost out to his teammate ‘DesmoDovi’ as he began to struggle after the lightning start; Folger and Petrucci the next to get through. ‘Baby Samurai’ Pedrosa then chose his moment to attack for P1, able to keep it as Dovizioso struck on Marquez – but the top three couldn’t quite yet begin to pull away from Folger in fourth, or ‘Petrux’ just behind. After a handful of laps playing high-speed chess, Dovizioso then went around the outside of Pedrosa to take the lead – pulling a small gap before Marquez followed the Italian through. A three-way fight then broke out between Alvaro Bautista (Pull&Bear Aspar Team), Johann Zarco (Monster Yamaha Tech 3) and Lorenzo for P6, with the squabble providing some spectacular wheel-to-wheel action and the Frenchman initially coming out on top. 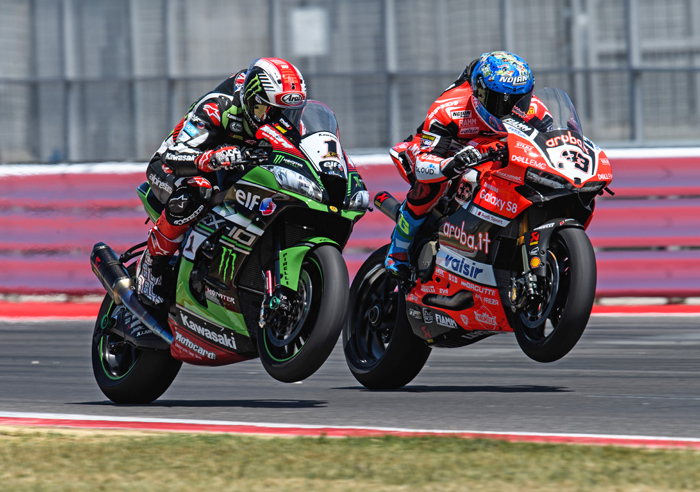 The drama wasn’t over, however, with some running out of rubber and some making big gains as the final laps approached – with Lorenzo on a charge back through and Folger one to fall back. Dovizioso pulls out his race winning lead over Honda's Marquez and Pedrosa. 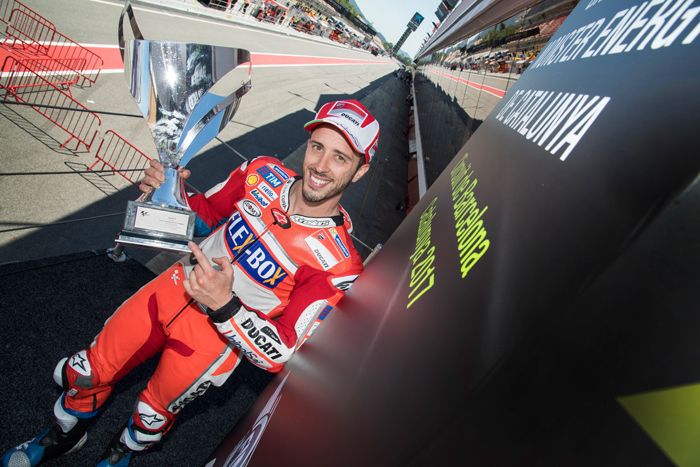 As ‘DesmoDovi’ arrived at the final lap clear in the lead, it became apparent the dream of Mugello wasn’t something the Italian yet had to wake from – crossing the line for his fourth career win to become the first Ducati rider since Casey Stoner in 2010 to win back-to-back. Marquez kept it calm to take second and get back on the podium after a tough Italian GP, with Pedrosa crossing the line in third to join his teammate on the bounce back from Mugello. Lorenzo sliced back through to take fourth at the flag, ahead of Zarco getting the better of Folger in a last minute duel between the Tech 3 machines. Bautista, after a late run off at Turn 1, came home in P7. Valentino Rossi came home in eighth after struggling in the latter half of the race, Hector Barbera (Reale Avintia Racing) took P9 in his 250th start in the World Championship, and Maverick Viñales (Movistar Yamaha MotoGP) made it to the flag in tenth - taking a big hit on his points lead in the Championship. Cal Crutchlow (LCR Honda), Loris Baz (Reale Avintia Racing), Scott Redding (Octo Pramac Racing), Karel Abraham (Pull&Bear Aspar Team) and home hero Tito Rabat (EG 0,0 Marc VDS) completed the top fifteen. EG 0,0 Marc VDS rider Jack Miller crashed out of top ten contention, with Aleix Espargaro (Aprilia Racing Team Gresini) also failing to see the flag after retiring with a problem. How the Monster Girls cooled down the crowd at the Catalunya MotoGP. Photo Massimo Olina. Maverick Viñales (25) is still leading theMotoGP standingsafter finishing in second behind Dovizioso (04), Rossie who crashed out (46) with Petrucci (9) in 3rd. Mugello, Italy, Sunday June 3rd 2017 - Italian rider, Italian bike, Italian GP…and the tricolore flew high over the podium at Mugello, as Ducati Team’s Andrea Dovizioso took a magnificent win battling rivals on track and illness off it to cross the line over a second clear of Maverick Viñales (Movistar Yamaha MotoGP) and an impressive home podium for second Italian Danilo Petrucci (Octo Pramac Racing). 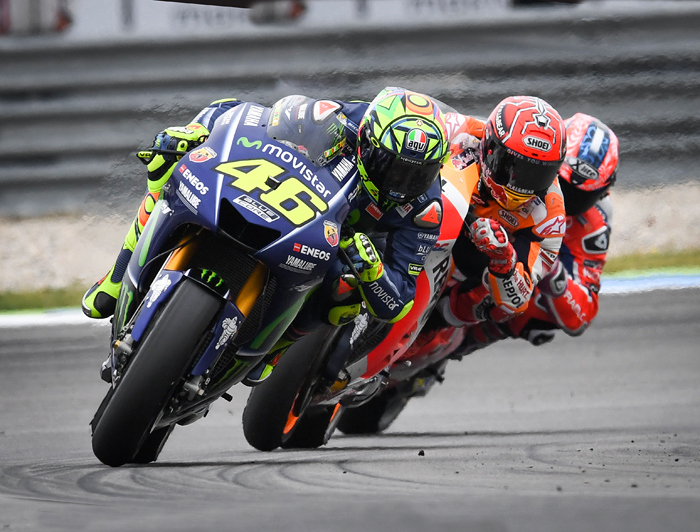 Home hero Valentino Rossi (Movistar Yamaha MotoGP) shot off the line for the lead from P2 on the grid, denying teammate and polesitter Viñales as Jorge Lorenzo (Ducati Team) stormed up from seventh to fight off Dovizioso for third. With the leaders in-line, over the line saw Lorenzo use the incredible speed of the Ducati to take the lead for the first time in red, dueling with old nemesis Rossi before the Italian took him back – and the next lap proved almost a replay as two of the men to have dominated the sport this decade found themselves sharing the front of the race for the first time this season. Then it was ‘DesmoDovi’ on the move past his teammate after Viñales had gone through on Rossi, the Championship leader taking the ‘Doctor’ as the trio began to break away from Lorenzo - with Petrucci on the chase. Andrea Iannone (Team Suzuki Ecstar) had an incredible start from P16 after having suffered with illness throughout the weekend, moving up into seventh, as Aleix Espargaro (Aprilia Racing Team Gresini) suffered a different fate and got a ride through for a jump start. 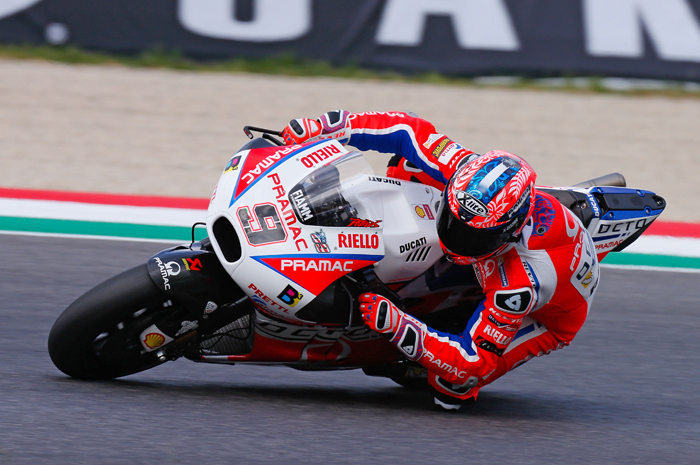 Petrucci caught the group before too long as Dovizioso took over at the front, and the Pramac rider then pounced on Viñales after a small mistake to follow ‘DesmoDovi’. Then it was holding station as the gaps grew and then shrunk, before the factory Ducati in the lead gained a small gap - and every member of the Borgo Panigale team held their breath as Viñales took over in second, only a few laps remaining and the Championship leader with his head down. 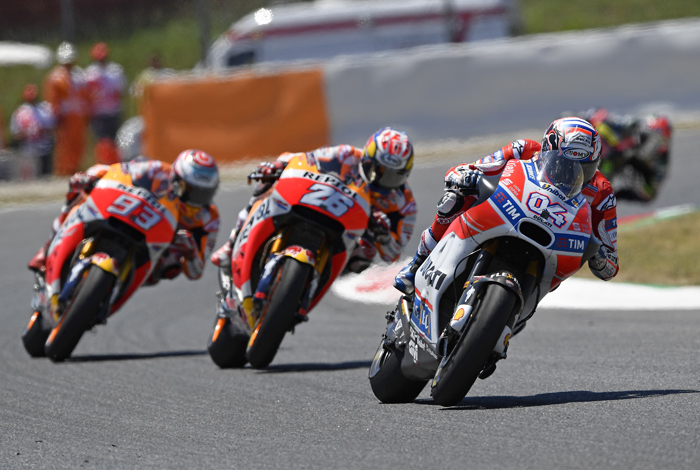 Closing in and then falling back, the pendulum swung between the two men until the last lap dawned – and ‘DesmoDovi’ kept it inch-perfect around every corner to take his third ever Grand Prix victory, and the first for a red machine at Mugello since Casey Stoner won in 2009. Viñales took second to increase his Championship lead once again, with Petrucci putting in the dry-weather ride of his life to complete the podium after staying clear of Rossi over the last couple of laps. The ‘Doctor’, who suffered a motocross crash in training the week before the event, pushed hard through the pain barrier at home and just missed the podium but took good points – as always, putting on a great show. Alvaro Bautista (Pull&Bear Aspar Team) took a big scalp as he caught and passed reigning Champion Marc Marquez (Repsol Honda Team) to complete the top five, with Johann Zarco (Monster Yamaha Tech 3) coming home in P7 behind Marquez. 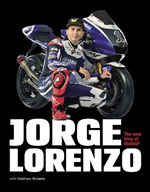 Lorenzo, after his early duel for the lead, suffered grip issues later in the race and crossed the line in eighth, beating Ducati test rider Michele Pirro over the line. Iannone’s heroics following his illness saw him complete the top ten at home. The late drama a little further off the front saw a tough day for Dani Pedrosa (Repsol Honda Team) conclude in a crash as the ‘Baby Samurai’ slid out, unfortunately collecting LCR Honda’s Cal Crutchlow on the final lap. Tito Rabat (EG 0,0 Marc VDS) took P11, with the top fifteen completed by Scott Redding (Octo Pramac Racing), Jonas Folger (Monster Yamaha Tech 3), Hector Barbera (Reale Avintia Racing) and Jack Miller (EG 0,0 Marc VDS). Now the paddock packs up and heads for Barcelona, as the Catalan GP turns the home tables for many on the grid – sure to result in another spectacular, spectacular. "This is the first weekend where we’ve felt like the benchmark"
Donnington Park, Great Britain, May 26-28th, 2107 - In a Sunday contest where only 14 riders finished, Jonathan Rea, Kawasaki Racing Team, recovered from a high speed crash in Race One on Saturday to win his eighth race of the year and Kawasaki’s 100th in Superbike history. Saturday's Race One was dominated by Kawasaki team mate Tom Sykes, who was was a close runner-up in Race Two on Sunday, just 1.601 seconds behind Rea after 23 laps, as KRT scored another 1-2 finish. 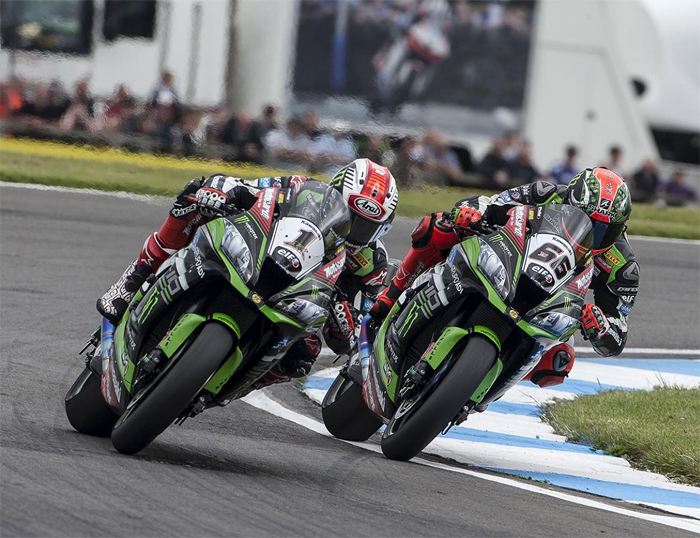 Jonathan Rea rode one of the most important races of his career to take the second race win at Donington Park, despite having to start from the fourth row of the grid because of his first day no-score. Rea made a superb launch and was able to ride around a first corner blockage that held back the early progress of Tom Sykes. Such was Rea’s early pace that he went from tenth on the grid to first place after just one complete lap and one additional corner. 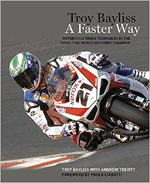 Sykes was in fifth place in lap one and eventually got to second place on lap seven. He made up time to Rea’s lead but with the laps counting down Jonathan had enough of an advantage to hold the gap and win his 46th race since he joined WorldSBK. With Rea winning today and Tom victorious in Saturday’s race the KRT duo sit 1-2 in the championship, with Jonathan 55 points ahead; 260 to 205. Chaz Davies, third in the race today and third in the points overall, is on 185. 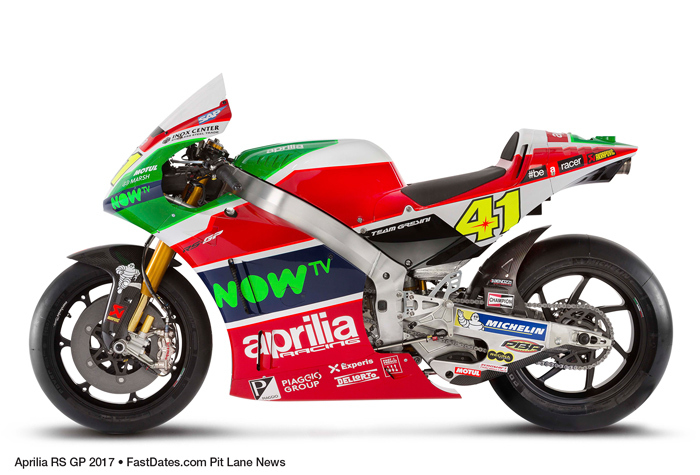 Now the championship will head to Italy for the seventh round, at the Misano World Circuit Marco Simoncelli. 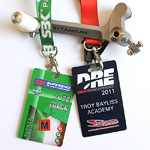 Racedays will be Saturday 17th and Sunday 18th June. Chaz Davies leads the race going into Lap 2. 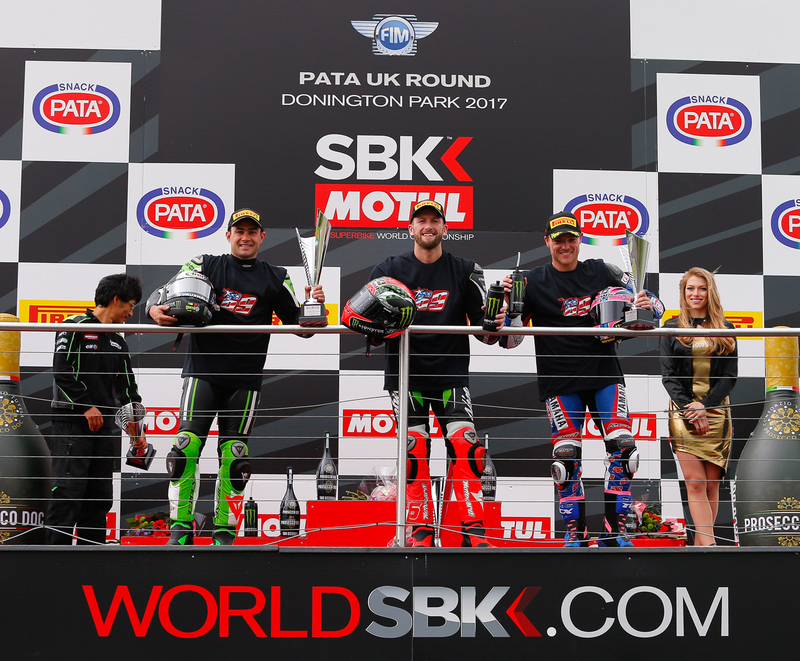 Saturday May 27th Race One - Tom Sykes (Kawasaki Racing Team) took a brilliant win in Race 1 of the PATA UK Round in a dramatic race which brought crashes for Jonathan Rea (Kawasaki Racing Team) and Chaz Davies (Aruba.it Racing - Ducati). Wildcard Leon Haslam (Kawasaki Puccetti Racing) and Alex Lowes (Pata Yamaha Official WorldSBK Team) made it an all-British podium, as Sykes took an amazing ninth successive victory in his home race at Donington Park. An incident-packed race saw provisional leader Davies go down in the early stages at turn 12, after he lost the front end. He picked his Ducati up to rejoin, eventually finishing eighth having crashed at the same corner as he did in last year’s Race 1 at Donington and this latest incident will be a big blow to his World title aspirations. With 6 laps to go Sykes got through on his teammate Rea to lead and within just over a lap he had opened up a two second gap on his Northern Irish teammate. Rea then suffered a high speed accident at turn 3, crashing out of the race, but was soon back on his feet and was taken back to the pits on a scooter. A superb ride by Haslam on his return to the series saw him take a highly creditable second place, whilst Lowes took third thanks to a late move on Marco Melandri (Aruba.it Racing - Ducati). Dutchman Michael van der Mark (Pata Yamaha Official WorldSBK Team) completed the top five, with Leon Camier (MV Agusta Reparto Corse) making it four Brits in the top six to further delight the home crowd. In seventh place Leandro Mercado (IODARacing) crossed the line a couple of seconds ahead of Davies, with Spaniards Jordi Torres (Althea BMW Racing Team) and Xavi Fores (BARNI Racing Team) completing the top ten after 23 breathtaking laps around the exciting 4.023km Donington Park Circuit. The riders and many of the fans in attendance carried stickers and flags in tribute to the late Nicky Hayden who tragically passed away earlier in the week after a cycling accident in Italy, with Sykes quick to pay his condolences to the Hayden family after the race in parc ferme. The podium finishers all wore t-shirts carrying Hayden’s famous number 69 in honour of the Kentucky Kid. Stefan Bradl (Red Bull Honda World Superbike Team) and Riccardo Russo (Guandalini Racing) unfortunately suffered technical issues and ended up with DNFs. 1st - Tom Sykes(Kawasaki Racing Team) "Fantastic, I had to work for it, but I need to pass my condolences to Nicky's family. It's very strange to not have my next door neighbour here with his great smile so it's been slightly strange all weekend. In a small way this is basically for him, and overall the weekend has been good and it's nice to continue our form." 2nd - Leon Haslam (Kawasaki Puccetti Racing) "Yesterdays pace, I felt comfortable to fight for the podium but today we had a bit of a problem and with the track temperatures changing it was behaving very differently. Obviously Chaz and Jonny crashed but I was just working my way through, working my own race and I'm so happy for Kawasaki Puccetti Racing." 3rd - Alex Lowes (Pata Yamaha Official WorldSBK Team) "Leon came up the inside, I went off track and Eugene hit me, that's expected from Leon with a wildcard, hes one of my best mates off track. It was a fantastic base and the bike was great, we had the pace for fourth but with Marco on the last lap, you've gotta go for it." Sunday May 28th Race Two - The PATA UK Round concluded on Sunday afternoon with a dramatic Race 2, which brought victory for World Champion Jonathan Rea (Kawasaki Racing Team) after a crash on Saturday, with Rea’s KRT colleague Tom Sykes and Aruba.it Racing – Ducati’s Chaz Davies also on the podium. Rea’s eighth victory of 2017 extends his lead in the standings to 55 points after six rounds and he rode brilliantly at the Donington Park Circuit to beat his teammate to the line by 1.601s and win his home race. 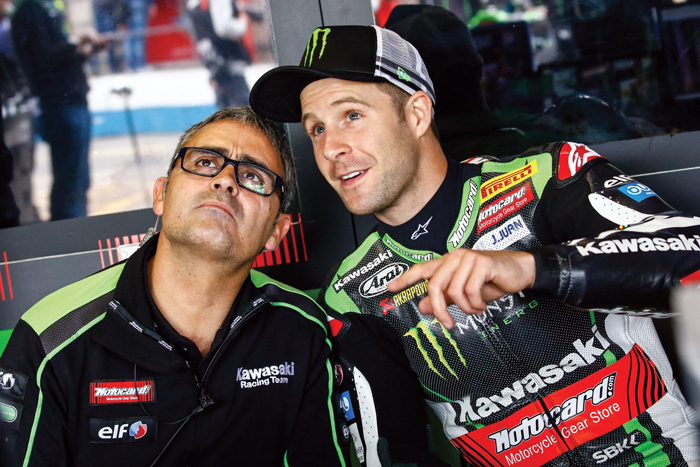 The result brought an end to Sykes’ remarkable run of nine successive wins at Donington and the Yorkshireman was amongst the first to congratulate Rea on his triumph. 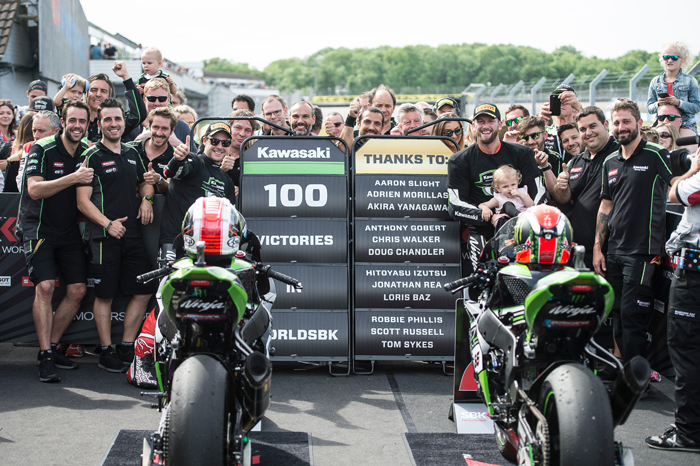 It was also Kawasaki’s 100th race win in WorldSBK. In parc ferme after the race Rea dedicated his win to the late Nicky Hayden who so sadly passed away earlier in the week after a cycling accident in Italy. Michael van der Mark (Pata Yamaha Official WorldSBK Team) had looked good for a podium result but was caught for third in the final stages by a determined Davies - who had crashed and finished eighth on Saturday. 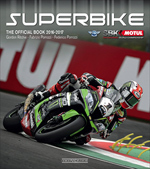 Alex Lowes (Pata Yamaha Official WorldSBK Team) completed the top five and Leon Camier (MV Agusta Reparto Corse) made it five Britons in the top six, crossing the line five seconds behind Lowes. Xavi Fores (BARNI Racing Team) was seventh and he was joined in the top ten by Roman Ramos (Team Kawasaki Go Eleven), Jake Dixon (Royal Air Force Reg. & Res. Kawasaki) and Raffaele de Rosa (Althea BMW Racing Team). Only 14 participants were able to finish the race as a number of high profile riders crashed out, including wild card Leon Haslam (Kawasaki Puccetti Racing), Randy Krummenacher (Kawasaki Puccetti Racing), Jordi Torres (Althea BMW Racing Team), Eugene Laverty (Milwaukee Aprilia), Leandro Mercado (IODARacing) and Alex De Angelis (Pedercini Racing SC-Project). Meanwhile, Marco Melandri (Aruba.it Racing - Ducati) stopped on the eighth lap after the chain of his Ducati Panigale R broke and fell loose. The WorldSBK grid will be back in action at the Pirelli Riviera Di Rimini Round at Misano over the16th-18th June weekend. P1 - Jonathan Rea (Kawasaki Racing Team) "It means a lot to me, we had to bounce bike and overnight the guys worked so hard. I knew I could win today but coming from 10th so so difficult and I guess thats what happens when I push really. I want to deadicate this race win to Nicky Hayden, the world is a worse place without him." P2 - Tom Sykes (Kawasaki Racing Team) "All good things come to an end in life but I'm happy. Today I lost a fair fight, unfortunaelt I had a bad start, my position wasn't good in ninth and I got boxed in. Rea took some closing down, but I had an exciteable and enjoyable race. The character of the bike was in the ball park, and today I was beaten fair." P3 - Chaz Davies (Aruba.it Racing - Ducati) "I think the podium is the big bonus here from the home race, it was a really tough race. It wasn't easy, I had to make it through a fair bit and I used up a lot of tyre. 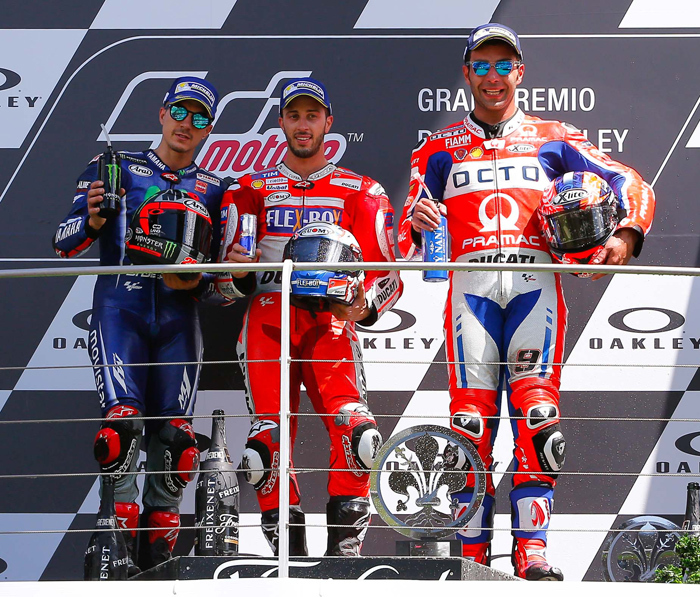 I'm really happy to be here and I want to dedicate this podium to the family of Nicky Hayden." 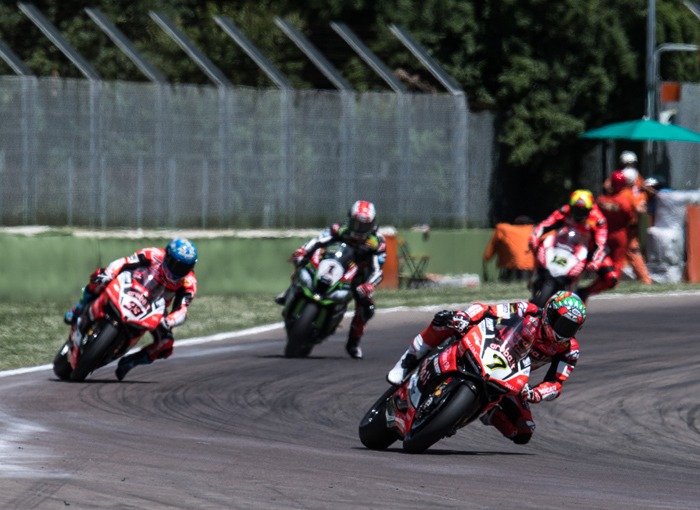 Imola, Italy 14 May 12-14th, 2107 - Aruba.it Racing Ducati rider Chaz Davies stunded in front of his home fans, securing a stunning double victory around the Iconic circuit of Autodromo Internazionale Enzo e Dino Ferrari di Imola. Davies secured the Gentlemen’s set – taking the pole position, fastest lap and two race wins at the Motul Italian Round. At a circuit his Panigale works so well around, Davies was able to take advantage of the second race restart, following a slow start off the line in the initial race. Firing off the line for the second start of race two, Davies worked his way through the field in stunning, smooth style and made it look easy to take his second victory of the weekend – and fourth in a row around Imola. 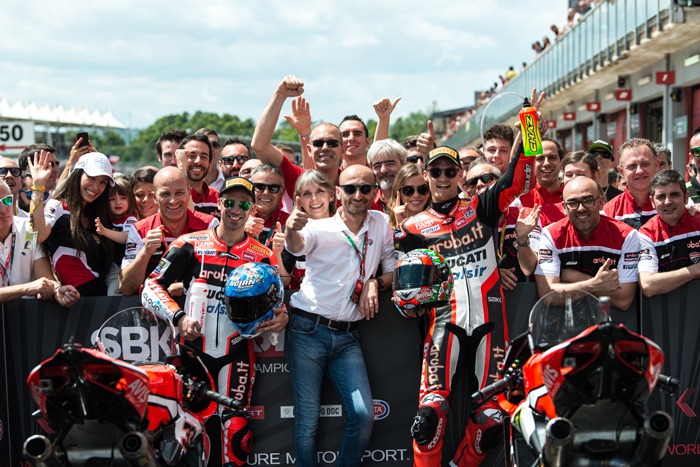 Marco Melandri, Ducati CEO Claudio Domenicali and Chaz Davies clelbrate their victory on Saturday at Imola. On Saturday morning at Imola it was Chaz Davies who took pole for Race 1 with a 1’45.662 lap time putting him at the head of the grid. 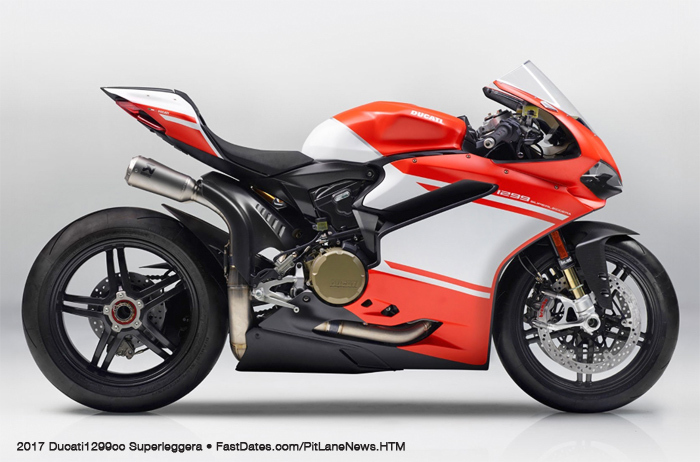 The Aruba.it Racing - Ducati rider will be joined on the front row at the 4.936km Italian track by Kawasaki Racing Team pair Tom Sykes and Jonathan Rea. 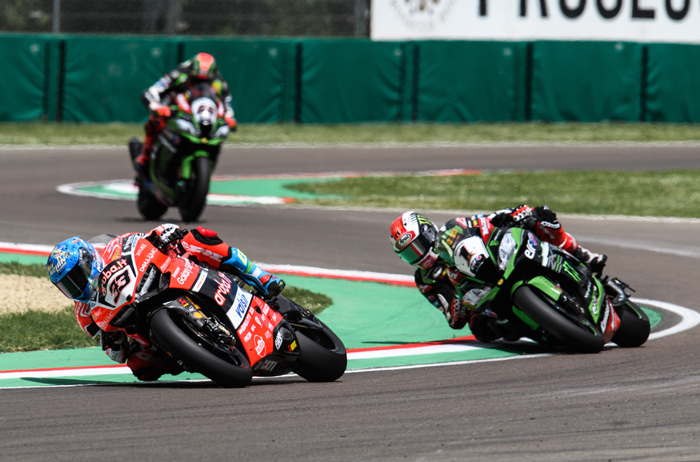 Davies won both Imola races in 2016 and he will aim to repeat that feat this weekend starting on Saturday afternoon ahead of his rivals, after Sykes lapped just +0.032s behind the Welshman in second and Rea qualified third, being +0.324s off the pole pace. Another British rider Leon Camier (MV Agusta Reparto Corse) was provisionally in second place before the pace increased right at the end of the session, but at his team’s home race he will be pleased to have qualified fourth. Also on the second row at the Motul Italian Round, lining up behind Camier, are top Italian qualifier Marco Melandri (Aruba.it Racing - Ducati) in fifth and Irishman Eugene Laverty (Milwaukee Aprilia) in sixth place. Row three will feature three additional nationalities, as Spaniard Xavi Fores (BARNI Racing Team), Argentina’s Leandro Mercado (IODARacing) and Dutchman Michael van der Mark (Pata Yamaha Official WorldSBK Team) line up seventh to ninth respectively. With an ambient temperature of 22°C and the track temperature reaching 34°C in the SP2 run, it was Lorenzo Savadori (Milwaukee Aprilia), Alex Lowes (Pata Yamaha Official WorldSBK Team) and Stefan Bradl (Red Bull Honda World Superbike Team) who qualified on row four. Earlier in the morning Jordi Torres (Althea BMW Racing Team) sat out the Tissot Superpole 1 session, not registering a lap time due to feeling unwell. In that SP1 session Bradl led the way with a 1'48.460 laptime, with Savadori also making it through to SP2 alongside the German rider with a late 1'48.572 time. Ducati's dominated in race one with Davies (7) and Melandri (33) taking the top spots ahead of points leder Jonthan Rea (1) and Tomm Sykes, with Xavi Fores'(12) Barni Ducati in 5th. Saturday, May13th SUPERBIKE RACE ONE - At the Motul Italian Round on Saturday Chaz Davies (Aruba.it Racing - Ducati) took a runaway victory in a race which was shortened due to a red flag, with Jonathan Rea (Kawasaki Racing Team) and Marco Melandri (Aruba.it Racing - Ducati) also featuring on the podium. Davies made a brilliant start from pole and was untouchable, leading by well over six seconds when the race ended early due to a red flag, after a big crash for Eugene Laverty (Milwaukee Aprilia) at turns 17 to 18 - which meant track conditions were not safe for racing to continue. Laverty walked away from the incident which saw his Aprilia RSV4 RF go up in flames and he was taken immediately to the medical centre for a check up after the high speed incident. With 12 of 19 scheduled laps having been completed at the time of the crash the rider placements at that stage were taken as the final race results, with Davies therefore claiming his second win of the season. The ever-consistent Rea picked up more important championship points in second, whilst Melandri made it a good day for Ducati on home territory in third place on the podium. Tom Sykes (Kawasaki Racing Team) was fourth, the Englishman trailing Melandri by less than a second, whilst Xavi Fores (BARNI Racing Team) continued his good form in fifth. Italian Duel! Leon Camier (12) moved the MV Agusta up past Leon Camier's Aprilia(50) for 5th place. Leon Camier (MV Agusta Reparto Corse) produced a good ride in sixth, whilst Michael van der Mark (Pata Yamaha Official WorldSBK Team) and his teammate Alex Lowes were seventh and eighth respectively. Roman Ramos (Team Kawasaki Go Eleven) and Stefan Bradl (Red Bull Honda World Superbike Team) completed the top ten. Leandro Mercado (IODARacing) crashed out at turn 7 early in the race, with Nicky Hayden (Red Bull Honda World Superbike Team) pulling into the pits shortly afterwards due to a technical issue. Jordi Torres (Althea BMW Racing Team) was unable to participate in Race 1 due to illness. 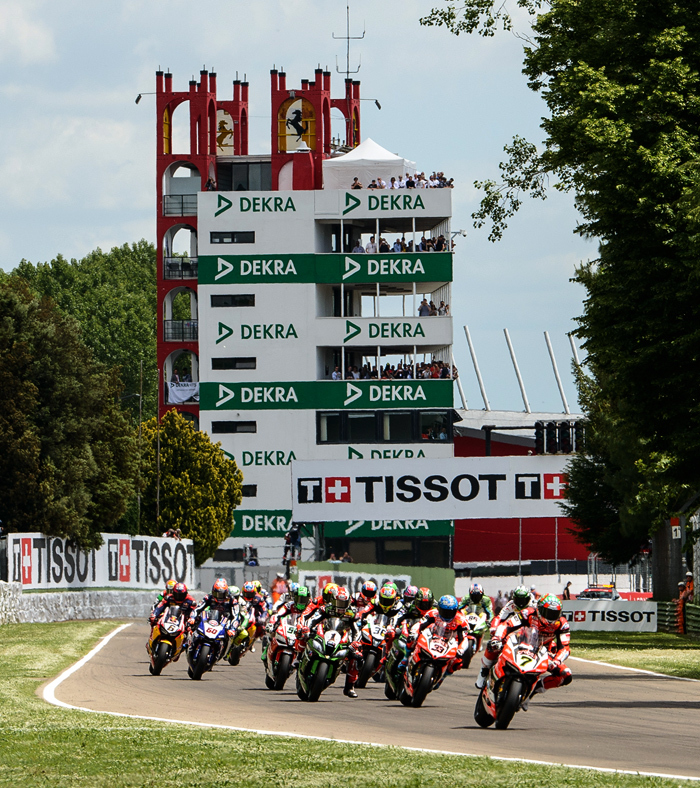 The WorldSBK riders will be in action again on Sunday with their second race taking place at 1pm local time at Imola. Saturday, May 13th SUPERBIKE RACE TWO - Today the Welshman grabs Round 5 Race 2 win from ninth on the grid, whilst Rea and Sykes also register podium results. 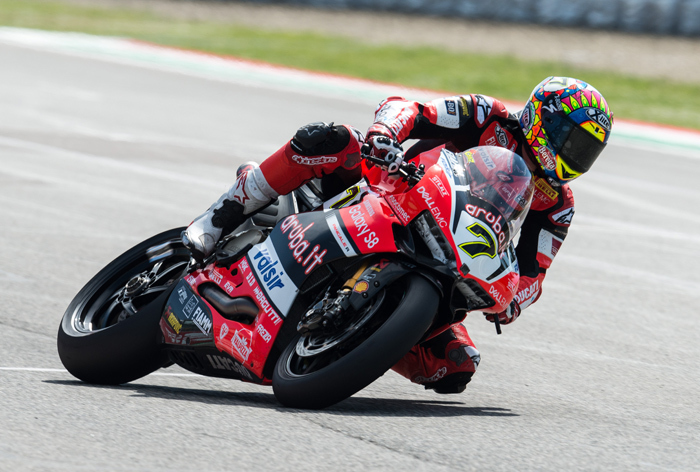 Ducati rider Chaz Davies who took a superb victory in front of the fans at Imola, with the podium also featuring Kawasaki Racing Team pair Jonathan Rea and Tom Sykes. In a restarted race - after a red flag in the first Race 2 start earlier in the afternoon – Davies produced a superb ride on the Ducati, overtaking provisional leader Sykes midrace and going on to win by just under four seconds from Rea. Davies’ first double victory of 2017 was a repeat of his Imola result from 2016, the Ducati man having also picked up maximum points at the Italian track last year. Sykes had led the raceat the start, but was eventually unable to hold off his teammate Rea for second, as the Northern Irishman ultimately beat the Yorkshirman across the line by +0.603s. Xavi Fores (BARNI Racing Team) and home rider Marco Melandri (Aruba.it Racing - Ducati) were engaged in a close fight for fourth, with Spaniard Fores finally coming out on top in that duel by less than two tenths of a second. Behind that pair Alex Lowes (Pata Yamaha Official WorldSBK Team) crossed the line in sixth place for more good points, with Eugene Laverty (Milwaukee Aprilia) close by in seventh. It was a solid result for Laverty after a difficult day for him on Saturday, with his big crash in Race 1. Likewise an excellent performance by Jordi Torres saw the Althea BMW Racing Team man finish in eighth place having got away from the back of the grid, after he missed Superpole and Race 1 on Saturday due to illness. Michael van der Mark (Pata Yamaha Official WorldSBK Team) and Leandro Mercado (IODARacing) completed the top ten, Mercado making amends for his Race 1 DNF. There was disappointment for Leon Camier (MV Agusta Reparto Corse) who crashed out of second place early on having made a superb start, with Alex De Angelis (Pedercini Racing SC-Project) also crashing shortly after the Englishman. 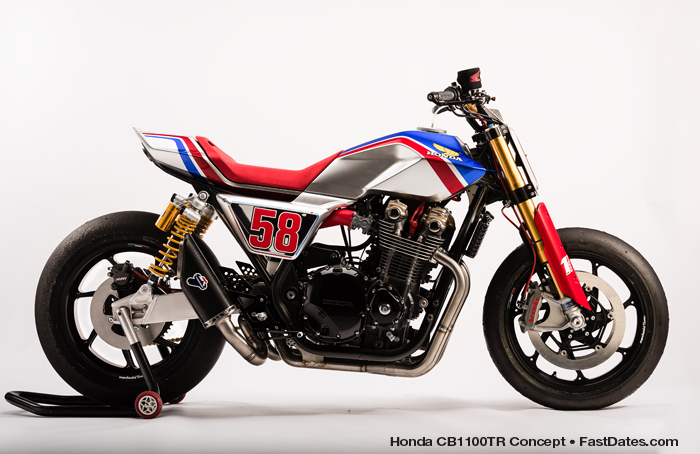 Stefan Bradl (Red Bull Honda World Superbike Team) was another crasher and Randy Krummenacher (Kawasaki Puccetti Racing) was forced to retire due to a technical issue. The initial staet of the race had earlier ended on the first lap in a red flag due to track conditions at turn 16, following an issue for Ayrton Badovini (Grillini Racing Team) with a blown engine which had left oil on track. 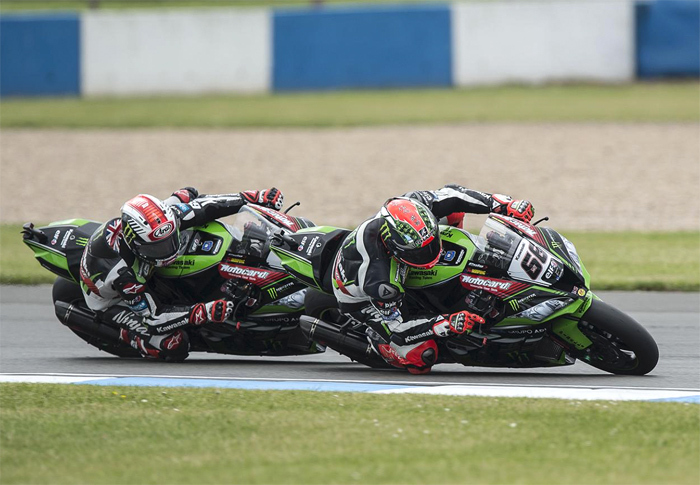 The WorldSBK riders will be back in action over the 26th-28th May weekend at the UK’s Donington Park circuit. 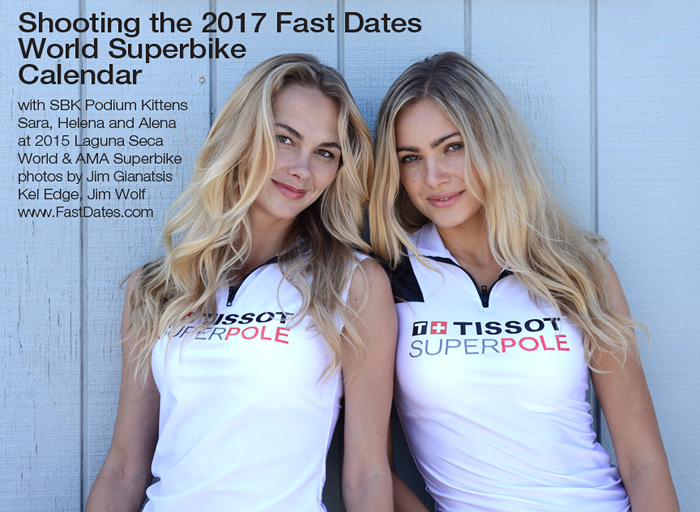 All Three Editions of this new 2017 FastDates.com Calendars feature our official SBK Fast Dates World Superbike Calendar Kittens Sara Horvath, Alena Pyshnaya from the Ukraine, and Alena Sovostikova from Russia, who spent the summer in America with Calendar photographer Jim Gianatsis to shoot and work at Mazda Raceway Laguna Seca USA World and AMA Superbike, and the LA Calendar Motorcycle Show. Follow the action behind the scrnes at the link above, and in our FAST 2017 Digital Magazine Yearbook in Members Corner. Order the New 2018 Calendars!